Leaving Tisvel we beat into the wind (with triple reefed mainsail, since we still don’t have the materials to fix our broken shroud), to Southwest Bay. Tahawus and Drina were there ahead of us. Just the three of us in a huge protected anchorage. 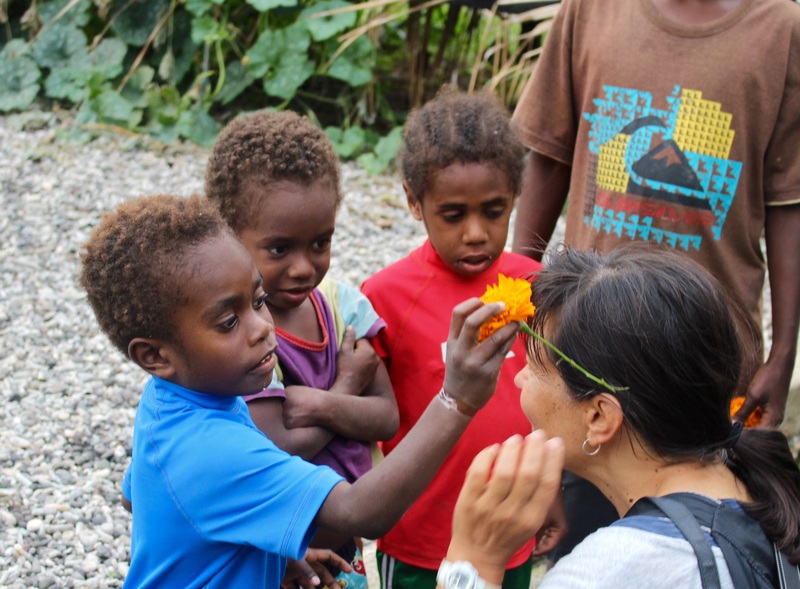 Doina had already met with the Chiefs ashore, and arranged for a guided tour of the tidal lagoon by the village. Bob and I joined the tour. 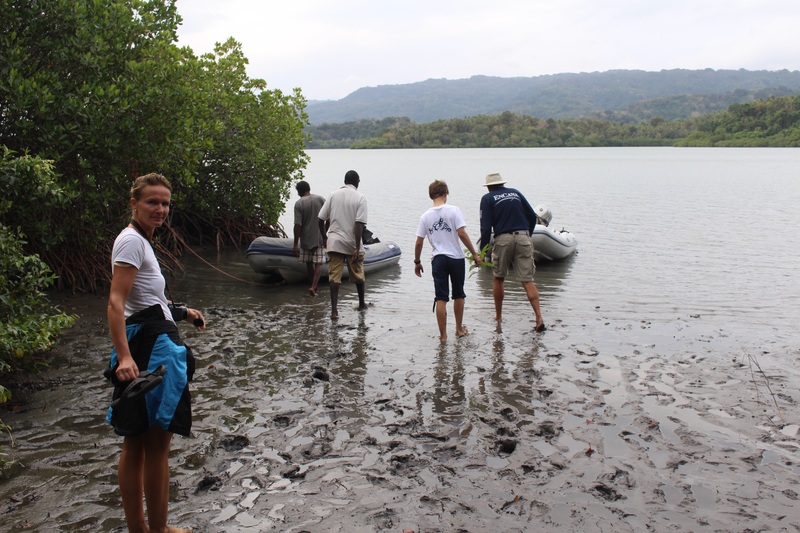 Taking two dinghies to the beach, we met Principal Chief James. Each tribe, which I believe equates to an extended family, has a chief. 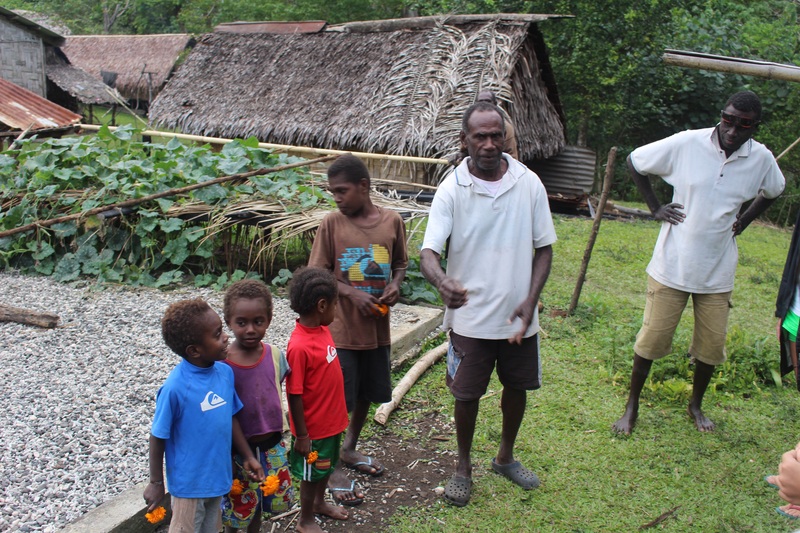 A Principal Chief is elected for a four year term to oversee the entire village. Or in this case it is a collection of four neighboring villages. 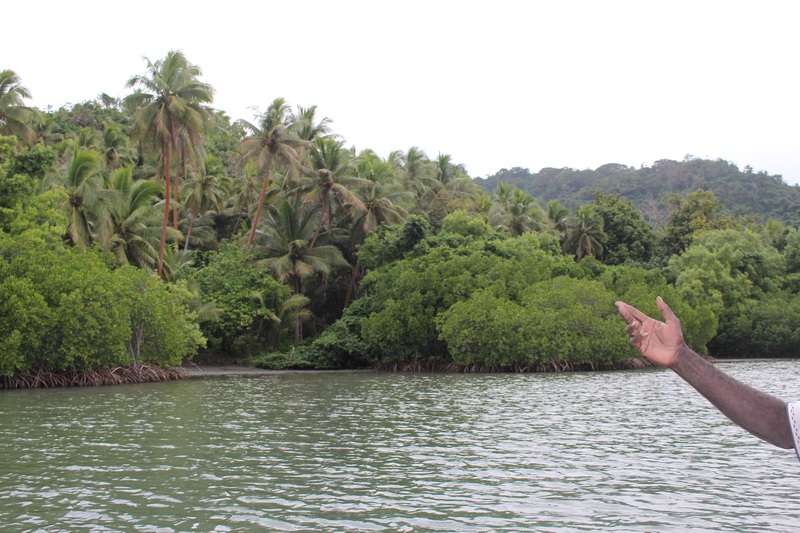 To visit the lagoon (or to snorkel at the reef) you must get permission from the chief. 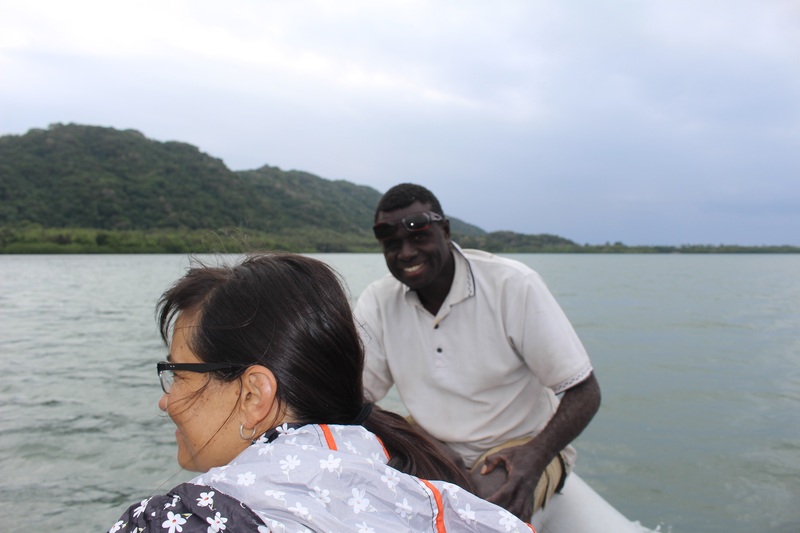 But you wouldn’t want to do it without a guide anyway, because what’s cool is not the lagoon itself, but the culture of the people living around it. 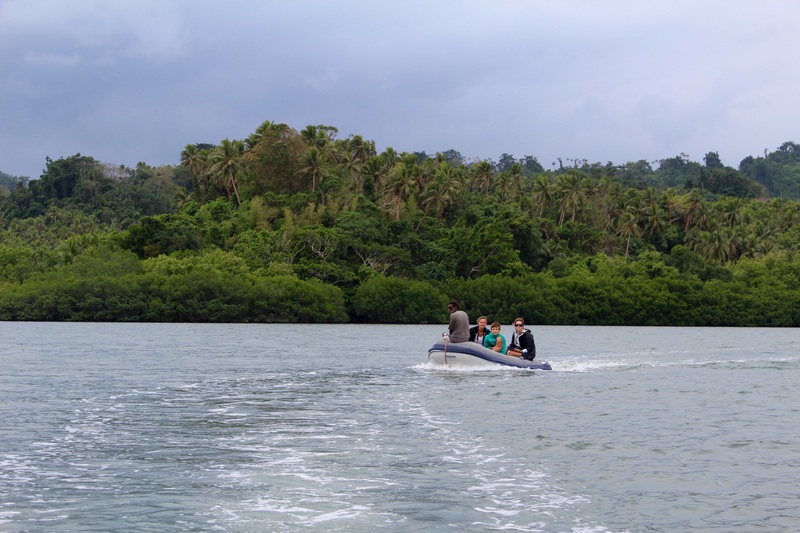 We negotiated a fee for our two guides for the two dinghies. James came with us. The second guide was Chief Esrom, who many years ago became Luc’s blood brother. Up the little tidal river we went, James sitting in the bow and pointing which way to go to avoid the shallows, and telling us about the villages and the customs. Past a field with a small heard of goats. Past a large canoe heavily loaded with firewood, paddled by two women. Past men working on building a guest house atop the steep bank, who hooted and shouted at us in fun, but I never saw them in the dense growth. Past endless mangroves at the water’s edge, with paths cut through every so often just wide enough for a canoe (with its outrigger) to get to the muddy shore, so a family can tend their garden there. We stopped for a short walk through the bush to a watering hole, where James demonstrated that you could drip the sap of a certain vine into the water, and it would “clean the water.” That is, whatever stuff was floating on the surface would move away from the sap, leaving a clear surface for drinking. 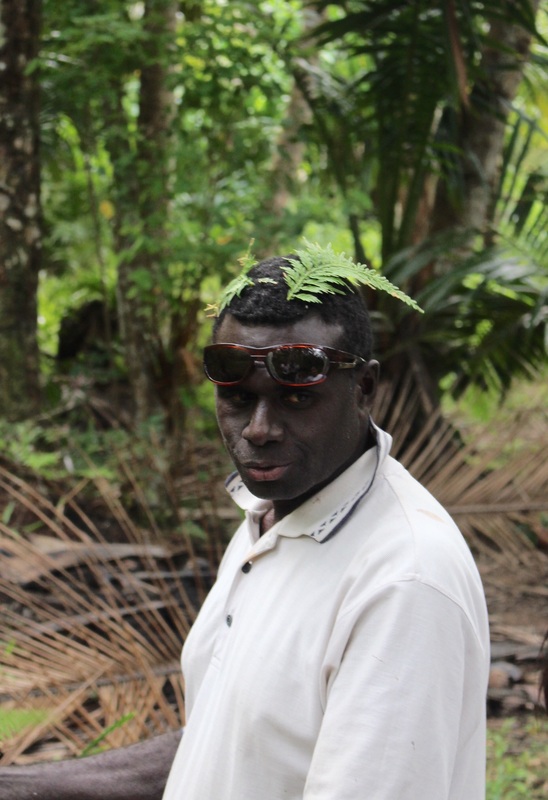 As we walked out, James told us about a custom, that if you kill someone in the bush (not clear to us if this referred to slaying an enemy or other forms of manslaughter), you place a certain leaf on your head when you are returning to the village. This announces that you have killed someone, and you are expected to go to the chief to tell the story. Dan volunteered to wear such a leaf into the village — James assured us he would explain that this was merely a demonstration. The village was up a well made set of steps to a plain above the water. We met the local chief (later we learned that he was James’ father), and after explaining the leaf on Dan’s head we were properly welcomed. 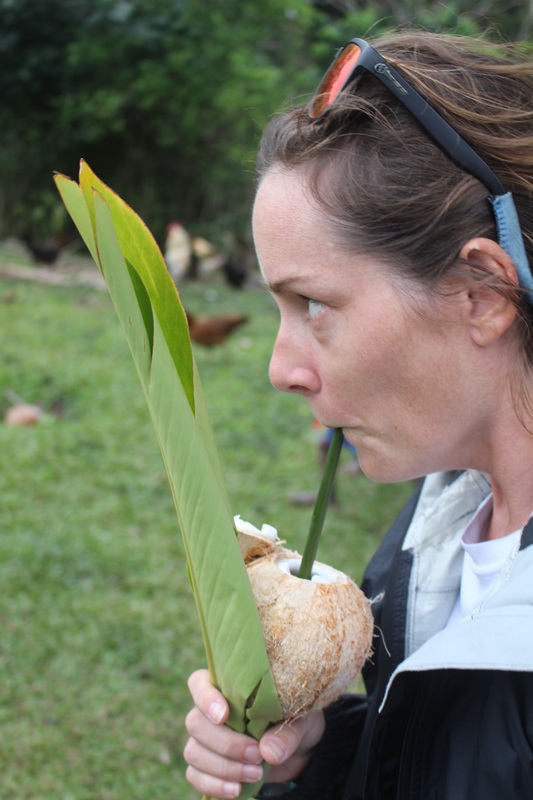 That is, the children gave us each a flower, and we each received a young coconut with a reed-like straw to drink the juice. 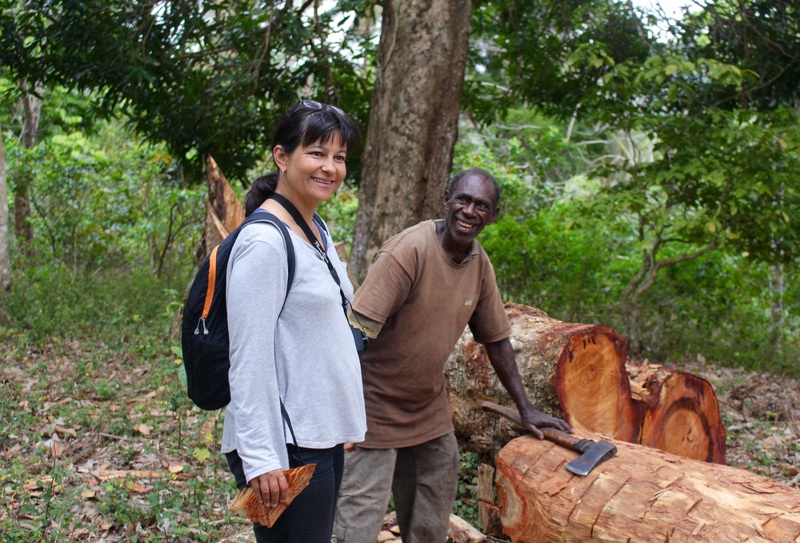 We walked through the little village and into the bush, to see a canoe being built. Before the first missionaries in 1895, canoes (and drums) were hollowed out by burning the inside wood. That approach gave way to the adze. Now more often than not the tool of choice is the chain saw — even for the inside. But our canoe builder was using an axe to strip the bark of the “blue water tree” log. The name does not refer to the distance the canoe will travel. Rather, it is what happens when you put the bark of the tree in the water. If you wait a few minutes, the water begins to turn blue. They demonstrated this for us. 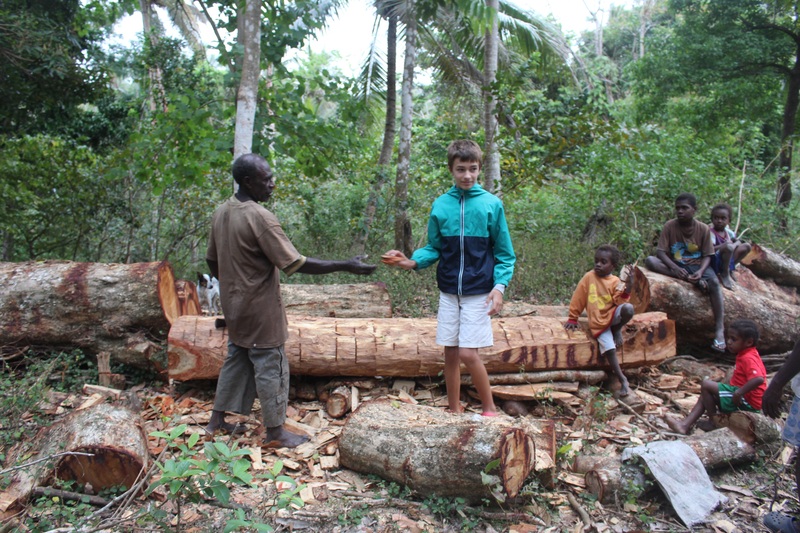 The blue water tree is the best wood for canoes – they will last 15 to 20 years. Canoes are also built from the “white wood tree,” but these they say last maybe 3 years. It takes a month for a man to build a canoe. Many men are capable of making a canoe, but (this said with a knowing look) only a few can make a special canoe. Walking through the bush we saw several flying foxes. Also known as fruit bats, these are ungainly looking bats that belong in a Tolkien story, that don’t look like they should really be able to fly. A young man had a slingshot, and attempted to bring one down (which we were assured he would eat), but with no luck. Chief James is the Principal Chief for a dozen tribes. People come to him for conflict resolution. Many disputes have to do with land rights. When this happens he has to review the history of the families involved, sometimes back many generations, to make his ruling. Asked if people always listened to him, he said, “Yes, they have to listen to me. If they didn’t I would refer them to the police!” There are higher level Chiefs, though — for the whole island of Malakula, for example — so I don’t know how the appeals process really works. 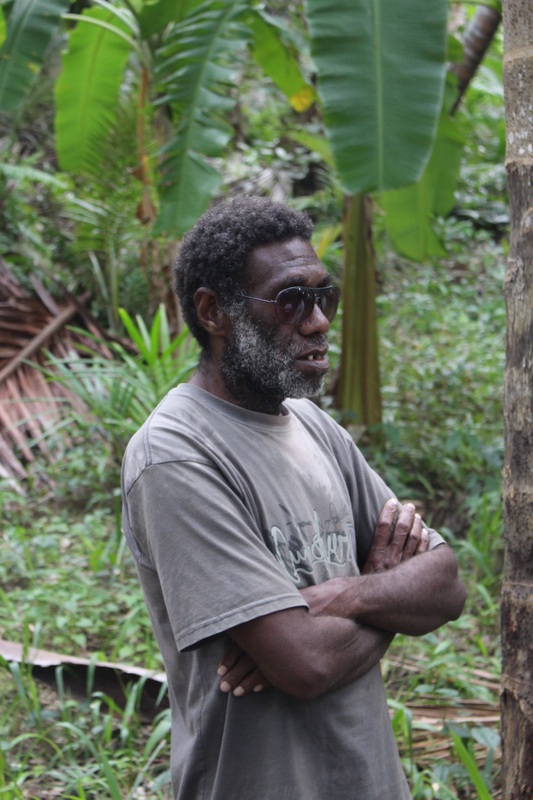 The land is owned by the villagers, which is not always the case in other South Pacific countries. Women can own land, but only if a family has no boys. 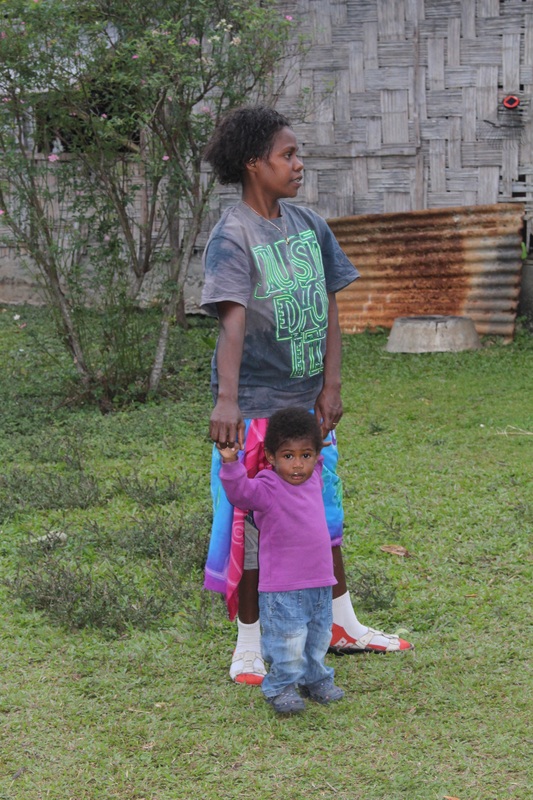 Women move to the villages of their husbands. I imagine that this is a difficult transition, because the neighboring village is likely to speak a different language. 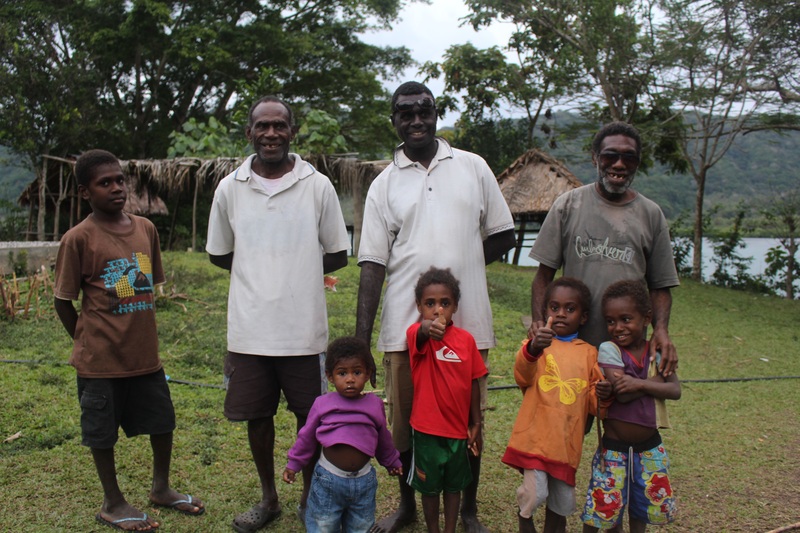 There are over 200 local languages within Vanuatu! The village on the east side of this bay speaks a different language than the village on the west side. Two dinghies go exploring in the lagoon. 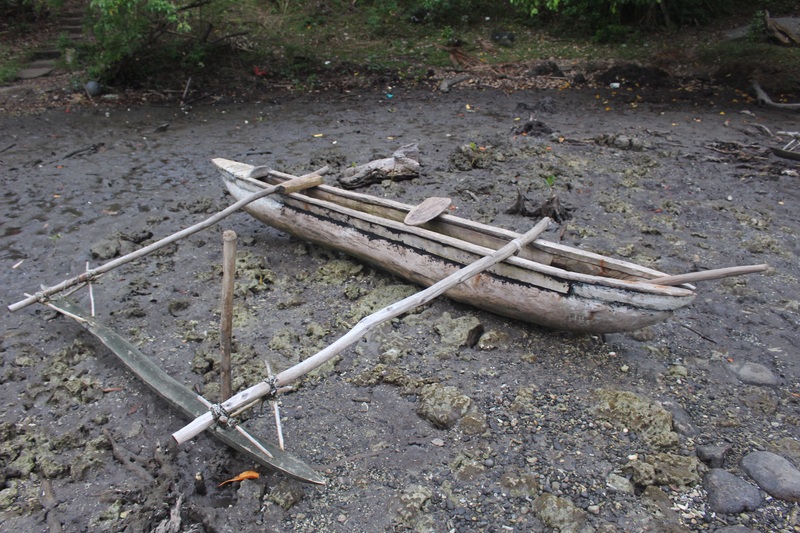 Every 100 yards or so is a little clearing in the mangroves, often just big enough to fit a canoe (with outrigger). 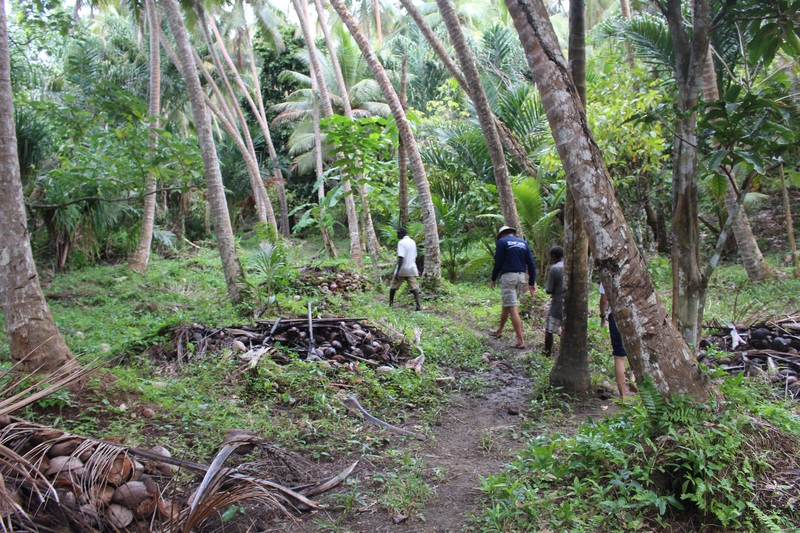 These have been cut so that village residents can access their “garden” in the bush. …where Chief Joseph demonstrates the leaf-message that he has killed someone in the bush. 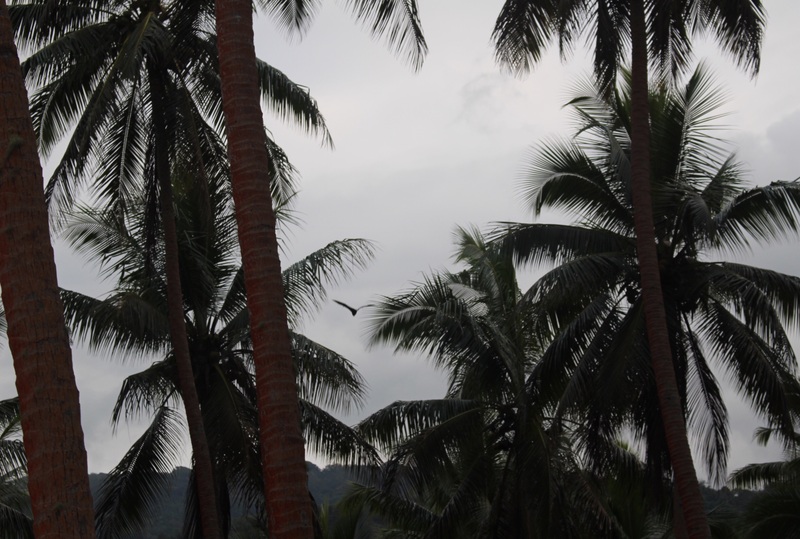 We walk through the village and on into the bush, where we see fruit bats — one in photo. 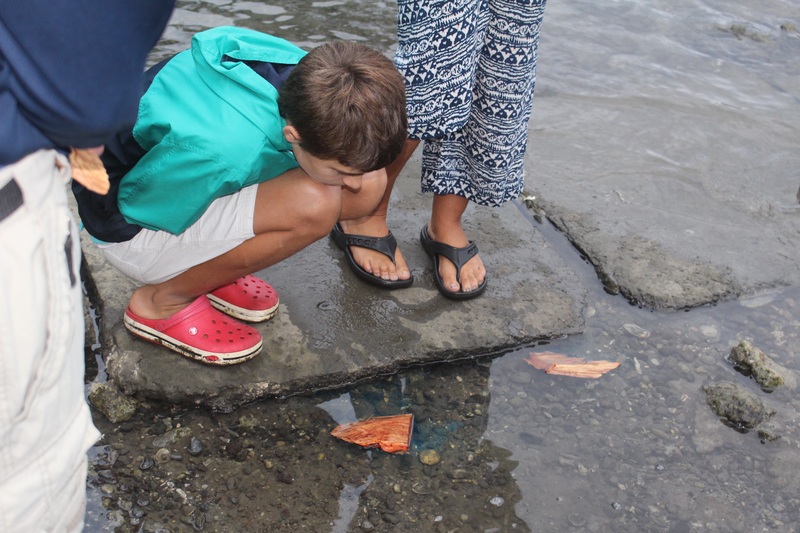 He gives Mirko a chip from the blue water tree. Corporate globalization reaches all the way to Vanuatu. On our way out we inspect a finished canoe with new appreciation. And we confirm that the blue water tree really does begin to turn water blue. Interesting ,,,, blue water tree is a bit magical turning water into such a blue hue! very cool, again these kids are too cute!